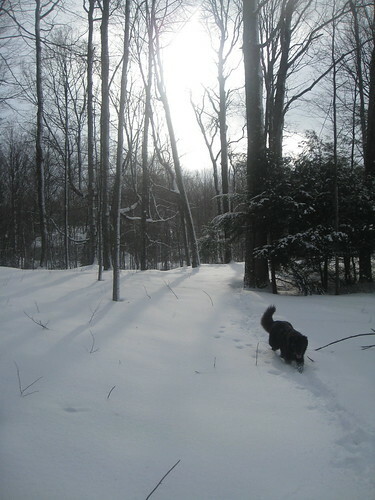 In a sweet and drawling voice, I am recounting the famous gingerbread man’s words—except substituting said cookie for a cup of hot cocoa—as Max and I trudge up the last snow piled hill before we’ll reach our back door. 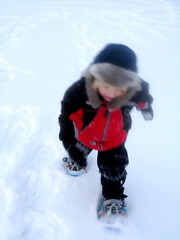 Max giggles for a second, and picks up his snowshoeing pace. For two steps. I am determined NOT to carry this child, now more than half the size of me, up the hill. And so I start with hot cocoa woman again, and throw her little friend marshmallow man in to boot. Sometime between New Year’s Day and the end of our horrible battle with influenza, I got serious about writing down my resolutions for 2009. There are the crafty ones (I will learn to knit. And embroider. And sew), the health-related ones (I will go to bed earlier. I will get serious about my yoga. I will let go of lattes…nevermind). There are the standard lofty resolutions; the promise to live simply; the goal of going back to thrift shopping and re-purposing and reducing our footprint on the planet; the spiritual seeking and present moment awareness stuff. 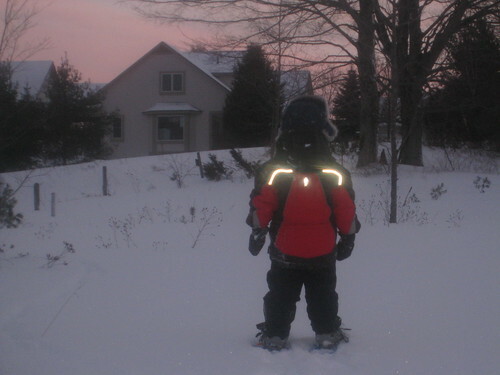 And then there are my parenting goals—which led me to my snowshoe adventure. I want to spend more time teaching my children about our community, its roots, and its history. I want them to intimately know the land around us. And now that there are three little people in our house, I want to carve out time every week to do these things with each of them, one at a time. 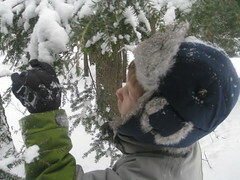 First, I took Noah out snowshoeing; while Max was still sick and we were all insanely stir crazy. Noah is our firstborn and has had the unfortunate role of parenting guinea pig for almost 10 years now. “It’s January 2 mom. Not like we’re that far removed from last year,” he said, barely looking up from his floor full of Lego creations in the making. As much of an advocate as I am for getting outside with children, I would be less than honest in saying my request did not solicit a whole lot of groans and exaggerated sighs. Which I ignored. In cheerful and dripping optimism. For some reason, Noah seemed to drag behind me. The only time he laughed or thought to catch up was when he attempted to snap a shot of Teton, one of our dogs, doing, um, her business. I found myself starting to wish I had stayed home and curled up with the stupid knitting needles I’d been chucking across the room in frustration. 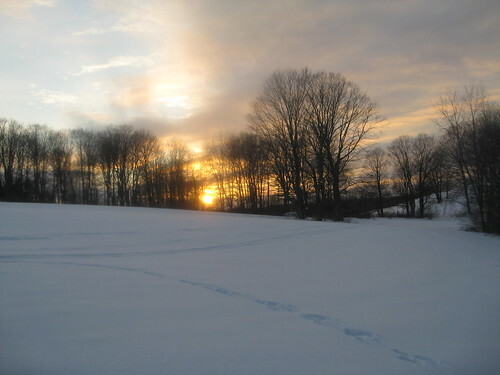 Noah got distracted, however, by a giant, snow-covered mound near the clearing of the field. He was soon standing on top, our two dogs dashing up and down beside him. I watched with a smile as he transformed into some clone trooper on an escape mission, “skiing” down the mound on his snowshoes and taking off full tilt into the field. So I followed. And I started to ask him about Star Wars. His face lit like it was untouched snow on a blue-sky morning. And he started to talk. And talk. And talk. As he went on about his top ten favorite characters—broken into good guys, bad guys, and good guys who became bad guys—we kept walking, and soon we’d reached the woods, my favorite part of the 90 acres behind our house. “Wow,” Noah said, pausing mid-sentence about the fascinating history of Bobba Fett. He had stopped in his tracks and was looking up. The setting sun was filtering in through the trees. The skeletal branches softened by snow and dusk lighting, there was something almost holy about their tall and quiet presence. We walked for a few minutes without saying a word. “Can you imagine what it would have been like, you, know, before settlers?” Noah asked, reaching out to touch a pine branch. Seamlessly, without planning or purpose, our conversation veered toward the Odawa Tribe that lived and roamed and worked and nurtured this land long before it was known as Harbor Springs. 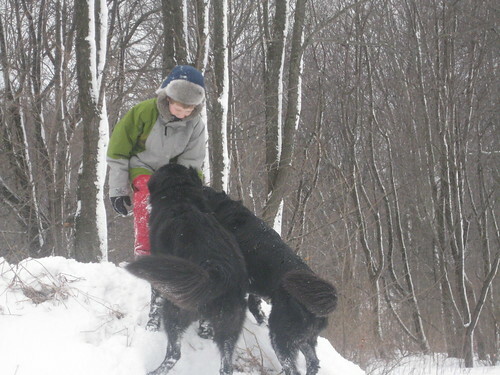 And that talk turned into imaginative play—Noah roaming the wooded trail in search of food and shelter, with his two dogs and his not-so-bright friend (me, apparently. Ahem). We got back to the house just before dark. The last stretch up the hill was taken in silence, crunching snow echoing in our ears as our dogs—which sounding more like galloping horses—broke trail in front of us. Of course, I can’t ever sit in the joy of such a fantastic outing without wanting to share it with my other littles, so soon enough, I wanted to take Max on a similar venture. And that’s where the I-will-not-budge-and-this-weally-stinks tantrum up the hill moments ago comes in. “It was great,” I hear, with the enthusiasm only a four year old can muster. Justin looks up at me and smiles as Max continues his accounts of our most exciting adventure. I, in turn, look out our bay window at set of tracks we made, one big, one little, disappearing into the field in a way that seems, well, picture perfect. I didn’t think it was possible for anyone to make me miss Michigan from the Florida Keys this January. Thanks a lot…your story has done it! You know, we feel frustrated and perplexed that it takes force to get kids outdoors sometimes, but if you look at most adults, who only get fresh air when walking to the car, and grumble about even that, it all kind of makes sense. Wouldn’t it be great if we could use the same approach with couch potato adults in our families. “I said get your boots on and get outside!!! And I’m locking the door for one hour so don’t even try to get back in!! !” Like if you are talking to your dad or your spouse or your lazy sister or something. Or maybe just throw the remote out in the snowbank and then lock the door when they go get it. Anyway, enjoyed the post. As always, great pix! the exhaustion that comes with getting our kids outdoors becomes part of the fond memories later in life. I swear it.